These are my 2, top is built of an Oly lower with mostly bushmaster parts. Bottom is built off of a DPMS lower and upper with a Bushy 14.5" barrel with a double Y comp pinned and welded to bring it to 16", working on plans for a third, a 24" match Hbar AR-10 in 260rem Thanks to Dan at gunconnection for the EOtech, my latest AR ornament. . . . . working on plans for a third, a 24" match Hbar AR-10 in 260rem . . . I have a .260 bolt gun and I think that is one of the best compromises for a long range cartridge one can pick. FWIW, I'd suggest going with the DPMS version of the AR-10 if you're looking to get easy LR performance, for their versatility. The Armalite package is slightly different and you just about have to go custom to get a decent "off caliber" upper for the "real" AR-10. 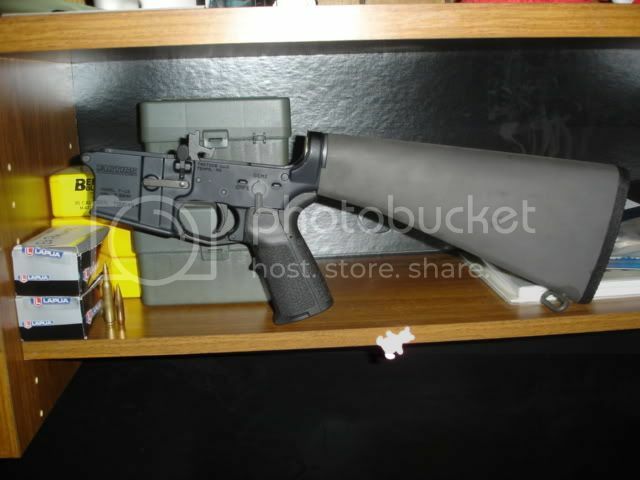 DPMS has quite a few "off the shelf" choices. The 10.5" SBR upper (registered config) is an LMT. CMT MPI bolt with upgraded extractor, Troy rail, ARMS low-profile BUIS. I don't have an optic for it right now...I'm thinking a Trijicon RX01 Reflex. The 7.5" upper is an RRA 9mm upper with ramped bolt, Gas-Buster charging handle, Troy rail, and EOtech 512. To run it, the lower gets a Hahn bottom-loading mag block and a "Slash" 9-Q buffer and Wolff XP spring. 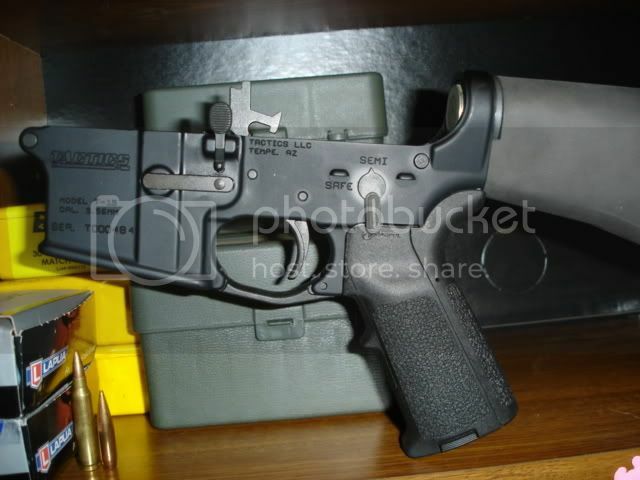 I also have a Colt 6920 upper for which I'm probably going to pick up a POF lower next week. Thinking about doing it in Dark Earth...not decided yet though. There's also an AR10 somewhere around here. Last edited by squirrels; April 12th, 2008 at 09:04 PM. whats the lowers run from manchesters? Who assembled that sweet lower? Is that a RRA trigger group? I have also been keeping an eye on the 6.5 creedmore, almost ballistically identical to the 260rem, but OAL is equal to standard 308win, and works better in an AR-10 action. I have built 4 AR's over the past couple years, and outside of the cost savings, the ability to match and hand fit specific parts and the reward of firing a rifle built from the ground up can't be beat.